Pictured with her completed fresh holiday arrangement is class participant Pam Stephens. 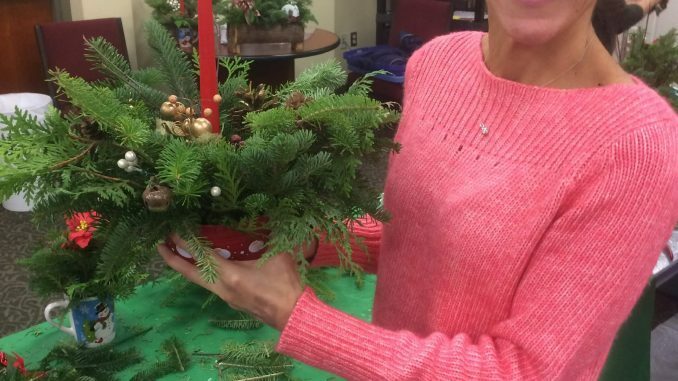 OSWEGO – The Friends of the Oswego Library hosted a Wreath and Evergreen Arrangement “Learn To” class on November 25 at the Oswego Public Library. 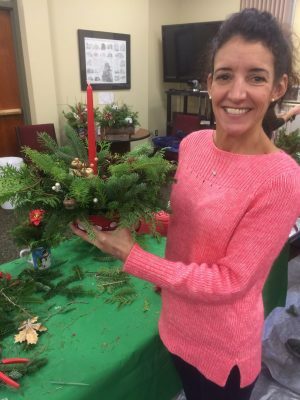 Thirty library patrons learned how to make and decorate a wreath or an evergreen centerpiece. Volunteers Greg Godici and Bonnie Perfetti taught the classes. The fresh greens for the classes were donated by Three Seasons Farm at 429 Drybridge Road in Mexico, Leonard’s Evergreens at 70 Dunham Road in Hannibal and Granger’s Christmas Tree Farm at 380 Tubbs Road in Mexico. The Friends hope library patrons will consider supporting these farms this tree buying season. This holiday season become a Friends of the Library member and give a gift of membership as well. Applications are available at the main desk at the Oswego Public Library.